All improvements at Fernhill Park are now complete. Work on the splash pad and restroom renovations project at Fernhill Park is complete. As announced at the August 25 splash pad opening celebration, Portland Parks & Recreation is pleased to share that cost savings on this project will be used to provide significant playground improvements to the existing playground at Fernhill Park, located near NE 37th Avenue and Ainsworth Street. These improvements will provide ADA accessibility to all new equipment, increased fall protection zones, and new site furnishings including benches and picnic tables. The existing whirl, teeter-totter, slide, and swings will be removed and replaced with new equipment in a new location closer to the other play equipment. The equipment located within the existing playground curb line will all be retained in its current location. By expanding the playground north, we are able to incorporate more play equipment providing increased play value for you and your children. The work will begin this fall and the playground will be fully complete by Spring 2019. Unfortunately we will need to close the playground over the winter to complete the above work in a safe manner. We will provide an update when it is ready for play. Thank you for your patience as we complete these improvements! And soon, a newly improved playground! The splash pad at Fernhill Park is complete! Thank you to our neighbors and community for celebrating its grand opening on August 25, 2018. Check out awesome photos from the event by clicking below. 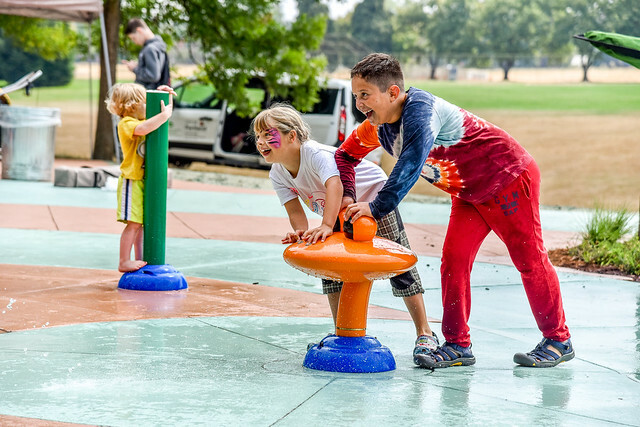 Fernhill Park is getting new play equipment, a splash pad, renovated restrooms, new water service lines, pathways, benches, irrigation improvements, and other park amenities, thanks to funding from the Parks Replacement Bond and System Development Charges. Fernhill Park is located at NE 37th Avenue and NE Ainsworth Street.